Parmesan and Herb Crusted Lamb Chops are easy to prepare and perfect for a spring special occasion for two. 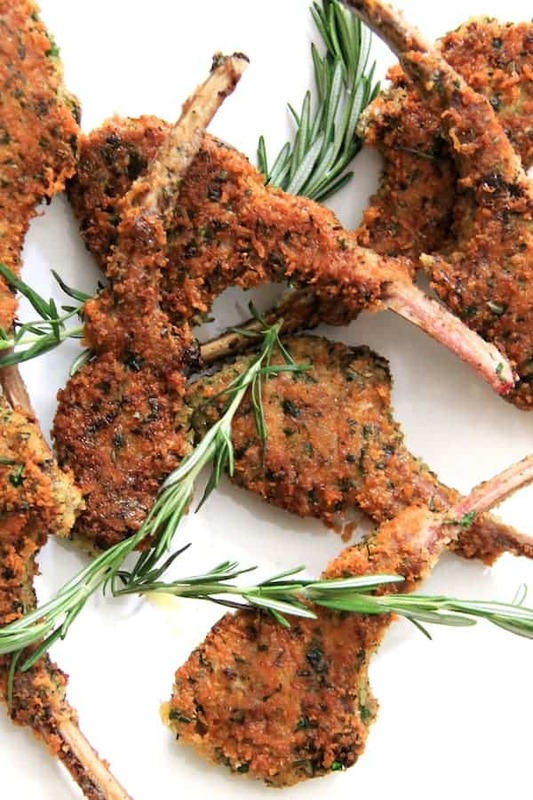 Are you intimidated by cooking a full rack of lamb? I know I am! The full rack can be tricky to cook properly and with each rack costing a small fortune, it’s not something you want to practice on. 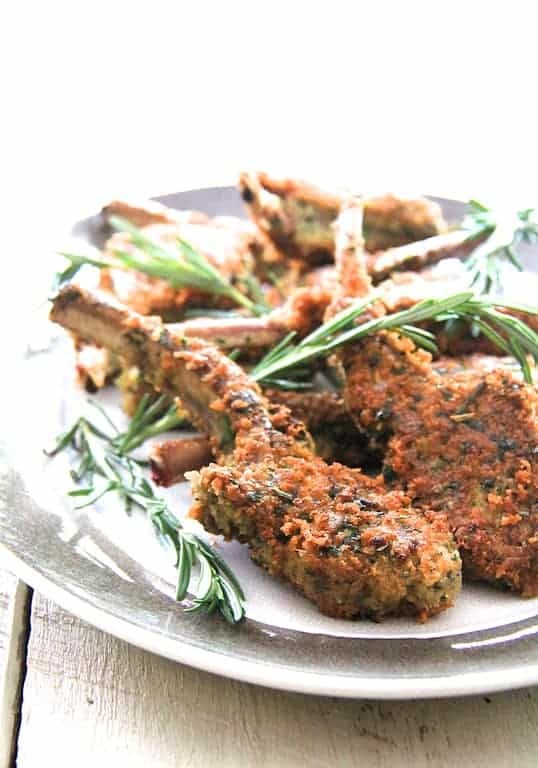 These crispy Parmesan and Herb Crusted Lamb Chops are easy to prepare and perfect for a spring special occasion for two. Spring lamb is often associated with Easter and Passover celebrations. However, spring has only just begun and there’s plenty of American-produced lamb available year-round. One rack of lamb generally has eight ribs. Ask your butcher to “french” the rack if it’s not already sold this way. To “french” it simply means to remove all the connective tissue and fat down to the main meaty portion of the rib so that the rib bone is exposed to create an attractive presentation. When cooking these chops, that exposed rib bone provides a convenient way to turn them without disturbing the coating. After frenching, cut the rack into eight individual chops. I don’t use a high-end imported Italian cheese for this coating. I prefer to use a good-quality pre-shredded American-made Parmesan like Sartori. You can find their amazing products in grocery stores around the country. I love their products because, for a domestic Wisconsin-produced cheese, they’ve won a ton of international awards. For the price, you can’t go wrong. This is not a paid endorsement, I simply love their cheese! The reason I use pre-shredded Parmesan cheese is because it’s dryer and often has a small amount of potato starch added to it so the end result will be crispier. After cooking the chops approximately two minutes per side, each rib chop should be cooked to about 130 degrees or between rare and medium-rare. Some slight residual cooking will occur, taking them to about 135 degrees which is perfect. So that you don’t have to hold them warm in a low oven, you may wish to cook them in two large pans. Four chops will fit without crowding in a 12-inch skillet. I like to pair these chops with a vegetable puree such as lima bean, cauliflower or celery root. Simply cook the vegetables in chicken stock with garlic and some onion or shallot. Drain the excess liquid then puree with an immersion blender or in a food processor. Braised baby carrots tossed with butter and parsley or chives are also a nice addition. 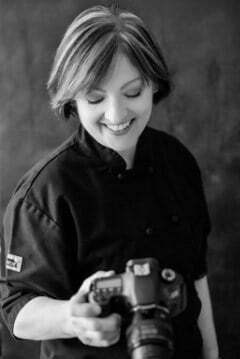 Thank you, hope you enjoy and please share this reader favorite at From A Chef’s Kitchen! 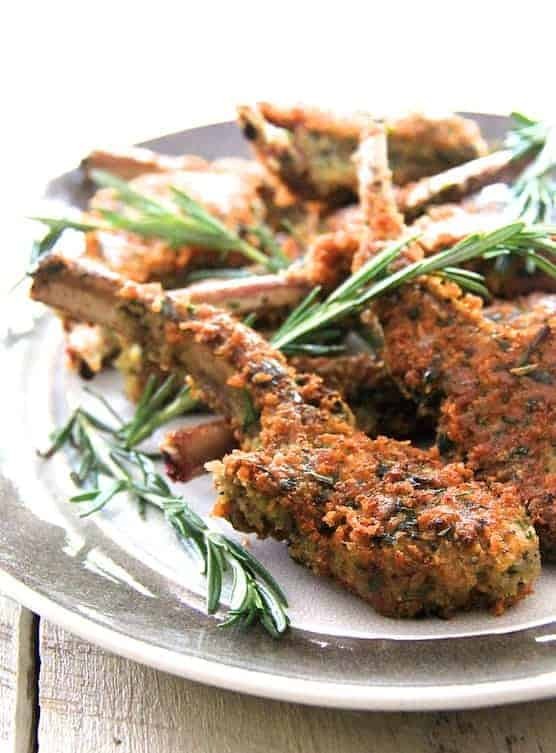 These crispy Parmesan and Herb Crusted Lamb Chops are easy to prepare and perfect for a spring special occasion for two. Combine flour, salt and 1 teaspoon black pepper on a plate. Place eggs in a bowl and beat to blend. Combine cheese, panko, rosemary, parsley, thyme, garlic and salt and black pepper to taste in a bowl. Dust lamb chops with seasoned flour, shaking off excess. Dip in eggs, then thoroughly coat with cheese, breadcrumb and herb mixture. Heat olive oil over medium-high heat in a large skillet. Add 3 to 4 chops, reduce heat to medium and cook until nicely browned, about 2 minutes per side. Transfer to a rack set over a baking sheet and hold warm in a 180 degree oven if necessary. Repeat with remaining chops. I’ve never cooked lamb before, but I just picked up the ones we raised from the butcher, so I guess I’ll learn. Made this for our first lamb meal. It was excellent. Served with roasted parsnips, beets and carrots, and a butter bean puree. Apple pie for dessert. So good, Thanks for the recipe! Hi, Antonia, Thanks so much! Your entire meal sounds amazing! Love the idea of a butter bean puree and the roasted vegetables sound divine. Thanks again and please stay in touch! This was amazing, used dry herbs instead, and subbed minced garlic for 1/2 teaspoon of garlic powder. After removed from skillet I placed the chops on a roasting rack and covered with foil. Placed in oven set at 350 degrees for 10 min then removed foil for let cookfor 5 min uncovered . It was amazing will definitely make again , thanks for a wonderful recipe! Thanks, Katie! So glad you enjoyed! And yes, by all means, improvise with what you have on hand and add your own twist. The personal touch is always best! I don’t often cook lamb chops, but I adore them. This recipe looks simple and almost foolproof. Can’t wait to try it. Might have to make a special trip to Costo for some chops really soon. Thanks, Kim! I hope you enjoy!